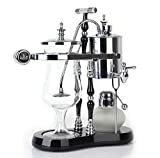 Syphon Coffee Maker for three-five Espresso Cups (500ML- about 17 OZ) Beautiful Gold Colour body with wooden boardbase Stainless steel water retainer,and plug Item included Heat-resistance glass, alcohol burner. Plated balancing shaft,and deal with, measuring spoon and glassful cup. Manufactured & Distributed by Diguo. Manufactured & Distributed by Diguo.